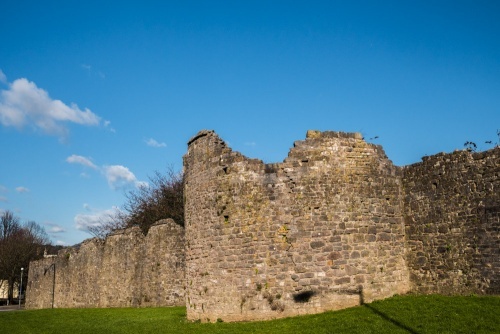 The late 13th-century town walls of Chepstow were largely the work of Roger Bigod II, Earl of Norfolk. 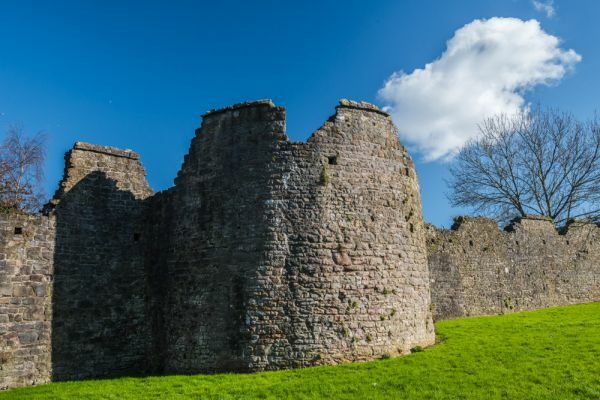 Bigod built strong stone walls around the town of Chepstow, and linked them to Chepstow Castle. The River Wye and the castle protected the town to the north, and the Port Wall to the south. The wall was 1100 metres long, 2 metres thick, and 4.6 metres high. It was pierced by at least a dozen circular towers, and a dry moat lay along the outer perimeter. Large sections of the walls survive, among them the Town Gate, located on Portwall Road. Town Gate was the only means of access through the wall. It was controlled by a gate and portcullis. It seems clear that the wall, though impressive, was meant to control access rather than to provide actual military defence, and for that reason it was known as a 'Customs Wall'. The best places to view the wall are near the rail station and by the main car park off Welsh Street, at the east end of town. My first glance of the Port Wall was the Town Gate, which seems rather hemmed in by buildings on both sides. 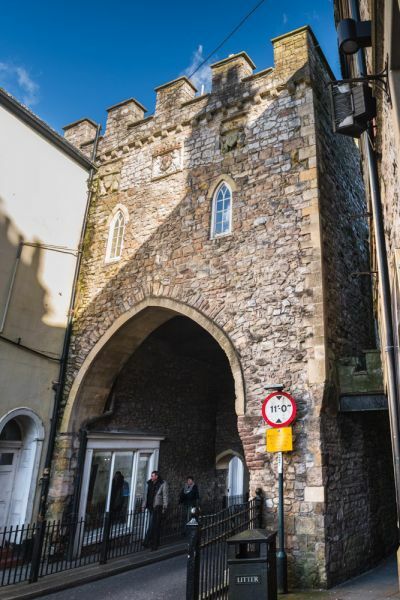 Even today the gate is a very busy place, but now it is pedestrians who pass under the medieval arch. 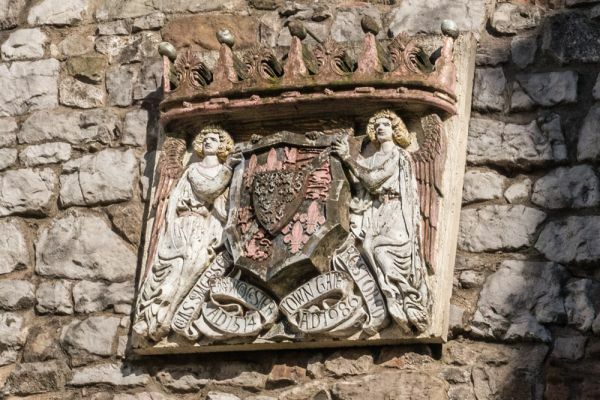 On the northern (outside) face of the gate is an ornate coat of arms commemorating the restoration of the gate. If you go west from the gate, past the modern library, and across the busy A48, you come to one of the best-preserved sections of the wall, complete with a semi-circular tower projecting outwards to provide guardsmen with a good field of view along the wall's exterior. This part of the wall is the easiest to reach from the town centre and provides a good idea of how it was constructed. What surprised me at first was how low the wall seemed, again emphasising that it was never meant to provide a strong defensive deterrent to attack but to control access to the town. The wall would have appeared slightly more imposing than it does now, for it was fronted with a defensive ditch, but this has now largely been filled in.